Review by AllTheBestFights.com: 2018-05-12, good fight between Kelvin Gastelum and Ronaldo Souza: it gets three stars (UFC Fight of the Night). The Tuf 17 winner Kelvin Gastelum entered this fight with a pro mma record of 14-3-0 (71% finishing rate) and he is ranked as the No.5 middleweight in the world (currently the #1 in this division is Georges St Pierre). He fought three times in 2017 beating Vitor Belfort (then overturned in a no-contest after he tested positive for marijuana – Belfort vs Gastelum), losing to Chris Weidman (Weidman vs Gastelum) and defeating Michael Bisping (Michael Bisping vs Kelvin Gastelum). His opponent, the black belt in Bjj, judo and former Strikeforce Mw champion Ronaldo Jacare Souza, has a record of 25-5-0 (84% finishing rate) and he entered as the No.9 in the same weight class. He lost to Robert Whittaker last year (Jacare vs Whittaker) but he came back to win in 2018 with Derek Brunson (Ronaldo Jacare Souza vs Derek Brunson 2). 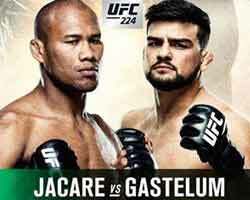 Gastelum vs Jacare Souza is on the undercard of Amanda Nunes vs Raquel Pennington – UFC 224. Watch the video and rate this fight! Review by AllTheBestFights.com: 2017-11-25, good finish between Michael Bisping and Kelvin Gastelum: it gets three stars (UFC Performance of the Night). The former Ufc Mw champion Michael Bisping (who replaces Anderson Silva) entered this fight with a pro mma record of 30-8-0 (67% finishing rate) and he is ranked as the No.5 middleweight in the world. In 2006 he had won over Anderson Silva (=Silva vs Bisping), Luke Rockhold (=Rockhold vs Bisping 2) and Dan Henderson (=Bisping vs Henderson 2) but in his last bout, occurred just 21 days ago, he has been defeated by current #1 Ufc Mw champion Georges St Pierre (=Bisping vs St Pierre). His opponent, the Tuf 17 winner Kelvin Gastelum, has a record of 13-3-0 (69% finishing rate) and he entered as the No.14 in the same weight class. He has already fought twice in 2017 beating Vitor Belfort (then overturned in a no-contest after he tested positive for marijuana – Belfort vs Gastelum) and losing to Chris Weidman (=Weidman vs Gastelum). 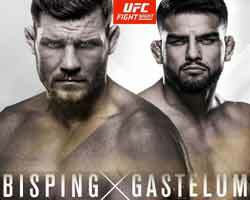 Gastelum vs Bisping is the main event of UFC Fight Night 122. Watch the video and rate this fight! Review by AllTheBestFights.com: 2017-07-22, good fight between Chris Weidman and Kelvin Gastelum: it gets three stars. The black belt in Brazilian jiu-jitsu and former Ufc Mw champion Chris Weidman entered this fight with a pro mma record of 13-3-0 (69% finishing rate) and he is ranked as the No.7 middleweight in the world (currently the #1 in this division is Michael Bisping) but he comes off three consecutive losses: against Luke Rockhold (=Weidman vs Rockhold), Yoel Romero Palacio (=Weidman vs Romero) and Gegard Mousasi (=Weidman vs Mousasi). His opponent, the Tuf 17 winner Kelvin Gastelum, has a record of 13-2-0 (69% finishing rate) and he entered as the No.10 in the same weight class. He lost to Neil Magny in 2015 (via split decision, Magny vs Gastelum) but then he has won over Johny Hendricks (=Hendricks vs Gastelum), Tim Kennedy (=Gastelum vs Kennedy) and Vitor Belfort (then overturned in a no-contest after he tested positive for marijuana – Belfort vs Gastelum). 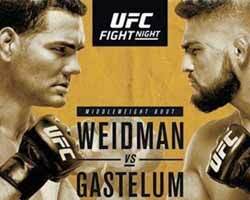 Chris Weidman vs Kelvin Gastelum is the main event of UFC on Fox 25. Watch the video and rate this fight! Review by AllTheBestFights.com: 2017-03-11, great fight between Vitor Belfort and Kelvin Gastelum: it gets three stars (UFC Performance of the Night). The black belt in Bjj, judo and former Ufc Hw and light-Hw champion Vitor Belfort (he is 39 years old, 14 years older than Gastelum) entered this fight with a professional mma record of 25-13-0 (84% finishing rate) and he is ranked as the No.9 middleweight in the world (currently the #1 in this division is Michael Bisping) but he lost three out of his last four bouts, against Chris Weidman in 2015 (=Weidman vs Belfort), with Ronaldo ‘Jacare’ Souza (=Belfort vs Jacare) and Gegard Mousasi in 2016 (=Mousasi vs Belfort). 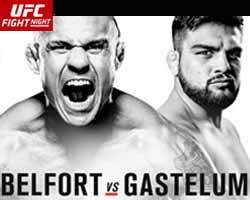 After losing to Weidman ‘The Phenom’ had won against Dan Henderson (=Belfort vs Henderson 3). His opponent, the Tuf 17 winner Kelvin Gastelum, has an official record of 13-2-0 (69% finishing rate) and he entered as the No.10 in the same weight class. He lost to Neil Magny last year (via split decision, Magny vs Gastelum) but then he has won over Johny Hendricks (=Hendricks vs Gastelum) and Tim Kennedy (=Gastelum vs Kennedy). Kelvin Gastelum vs Vitor Belfort is the main event of UFC Fight Night 106. Watch the video and rate this fight! Review by AllTheBestFights.com: 2016-12-10, good fight between Tim Kennedy and Kelvin Gastelum: it gets three stars. The Tuf 17 winner Kelvin Gastelum entered this fight with a pro record of 12-2-0 (67% finishing rate) and he is ranked as the No.6 welterweight in the world. He lost to Neil Magny last year (via split decision, Magny vs Gastelum) but he came back to win in 2016 against Johny Hendricks (=Hendricks vs Gastelum). His opponent, the black belt in Bjj Tim Kennedy, has an official mma record of 18-5-0 (78% finishing rate) but he is not ranked as he hasn’t fought since September 27, 2014 when he was defeated by Yoel Romero (=Kennedy vs Romero). 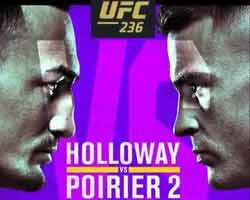 Before this bout he had beat current #1 Ufc Mw champion Michael Bisping (=Bisping vs Kennedy). 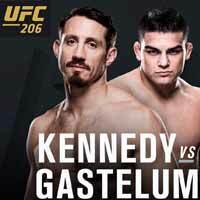 Gastelum vs Kennedy is on the undercard of Max Holloway vs Anthony Pettis – UFC 206. Watch the video and rate this fight! Review by AllTheBestFights.com: 2016-07-09, good pace with some nice exchanges: Kelvin Gastelum vs Johny Hendricks gets three stars. The former Ufc Ww champion Johny Hendricks entered this fight with a professional mma record of 17-4-0 (53% finishing rate) and he is ranked as the No.6 welterweight in the world but he lost two out of his last three bouts: the rematch with #1 current Ufc champion Robbie Lawler (=Hendricks vs Lawler 2) and with Stephen Thompson in 2016 (=Hendricks vs Thompson). Between these two fights he won over Matt Brown (=Hendricks vs Brown). His opponent, the Tuf 17 winner Kelvin Gastelum, has an official record of 11-2-0 (73% finishing rate), he entered as the No.14 in the same weight class and he was defeated twice in his last three fights as well. He lost via split decision with Tyron Woodley (=Woodley vs Gastelum) and Neil Magny (=Magny vs Gastelum), but he beat Nate Marquardt between the two defeats (=Gastelum vs Marquardt). 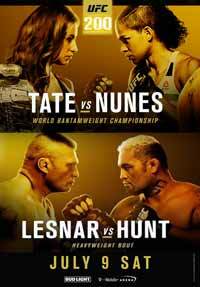 Hendricks vs Gastelum is on the undercard of Miesha Tate vs Amanda Nunes – UFC 200. Watch the video and rate this fight! Review by AllTheBestFights.com: 2015-06-13, high pace and nice exchanges: Kelvin Gastelum vs Nate Marquardt gets three stars. The TUF 17 winner Kelvin Gastelum entered this fight with a mma record of 10-1-0 (70% finishing rate) and he is ranked as the No.13 middleweight in the world. In his last three bouts he beat Nicholas Musoke (=Gastelum vs Musoke) and Jake Ellenberger (=Ellenberger vs Gastelum) but then he suffered his first defeat, against Tyron Woodley (via split decision, Woodley vs Gastelum). His opponent, the black belt in Bjj and Pancrase/Pankration and former Strikeforce Ww champion Nate Marquardt, has an official record of 33-14-2 (76% finishing rate) and he entered as the No.32 in the same weight class but he won just one out of his last five bouts, against James Te Huna in 2014 (=Te Huna vs Marquardt); after this fight, his last bout, he was defeated by Brad Tavares (=Marquardt vs Tavares). 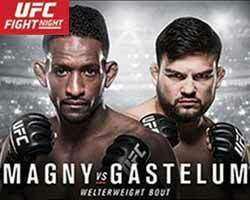 Gastelum vs Marquardt is on the undercard of Cain Velasquez vs Fabricio Werdum – UFC 188. Watch the video and rate this fight! Review by AllTheBestFights.com: 2015-01-31, disappointing fight between Tyron Woodley and Kelvin Gastelum: it gets two stars. Tyron Woodley entered this fight with a pro mma record of 14-3-0 (71% finishing rate) and he is ranked as the No.4 welterweight in the world (currently the #1 in this division is Robbie Lawler); he fought three times in 2014 defeating Carlos Condit (=Condit vs Woodley) and Dong Hyun Kim (=Woodley vs Kim) but between these two bouts he lost to Rory MacDonald (=MacDonald vs Woodley). His opponent, the undefeated Tuf 17 winner Kelvin Gastelum, has a perfect record of 10-0-0 (70% finishing rate) and he entered as the No.12 in the same weight class; he fought three times in 2014 as well, beating Rick Story, Nicholas Musoke (=Gastelum vs Musoke) and Jake Ellenberger (=Ellenberger vs Gastelum). 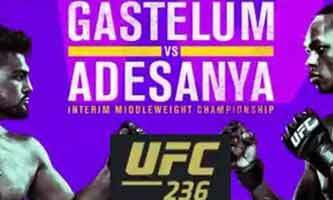 Woodley vs Gastelum was originally scheduled as a welterweight bout but Kelvin weighed in ten pounds over the limit of 170 lbs, so he was fined 30 percent of his purse for the infraction; this fight is on the undercard of Anderson Silva vs Nick Diaz – UFC 183. Watch the video and rate this fight!